This is an explanation of the intended way to use TR LOG with two radios in the ARRL November Sweepestakes, CW. The concepts and techniques presented here can work for you in other contests, as most of the ideas are the same. The resource is currently listed in dxzone.com in a single category. The main category is Single operator two radios that is about SO2R Single operator two radios. 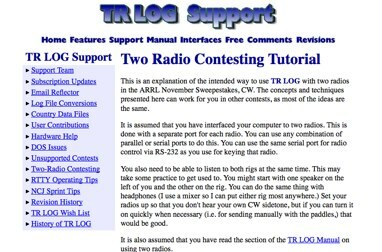 This link is listed in our web site directory since Wednesday Jun 3 2015, and till today "Two Radio Contesting Tutorial " has been followed for a total of 92 times. So far no one has rated yet, so be the first to rate this link !